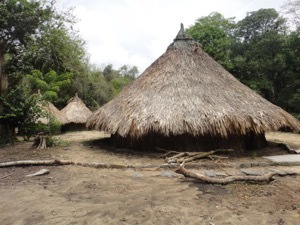 We journeyed to Santa Marta, Colombia for the same reason many people do: Tayrona National Park. We had heard amazing things about the park, the beaches, and the laid back atmosphere everyone had. We had also read some unseemly things about the corruption of the park guards, that they would try to plant drugs on you or pocket any money they found when searching your bag for said drugs, but we decided to give it a go as most people said the park was not to be missed. The park consists of a series of camping spots and beaches along the shoreline, which are accessible only by hiking in. There are several ways to get into the park, the easiest being taking a bus to the gate, and then a 4×4 to the start of the walk along the beach. Victoria and I chose to enter via a different gate at Colinas de Calabazo. 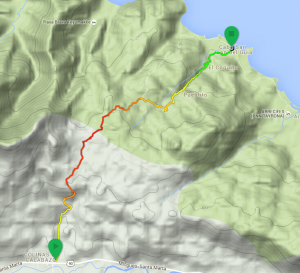 This allowed us to hike through the forest, visit an old indigenous village called El Pueblito, and end up at the final and most famed beach: Cabo San Juan de Guia. We also read that if you got there before 6:30am, the gate keeper wouldn’t be there and you’d get free entry. Sadly we didn’t get there early enough and had to pay! The trip to the beach via Calabazo starts off the same way: by taking a bus from the market in Santa Marta at Calle 11 and Carerra 11 (onze y onze). There the buses wait for enough people to get on before taking off, after which a tout hangs from the door trying to wrangle more people into the bus as it travels along. After about 45 minutes we reached Calabazo and were ready to start our hike. It was enjoyable enough, some nice forest trail, some rock hopping, but it was an incredibly hot day. We had started the hike at about 8am, and by 10am we were sweating like crazy needed multiple re-coats of bug spray and sun block. 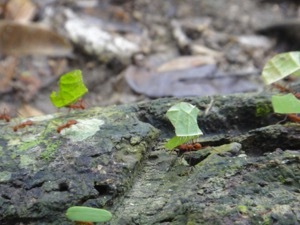 One of the most enjoyable sights was actually the number of leaf cutter ants we saw along the trail. 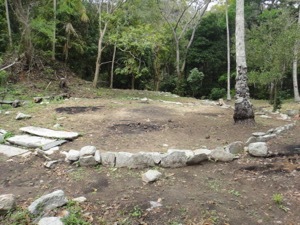 After about 2.5 hours, we arrived at Pueblito, which was marked by several large (10m diameter or so) circles made of stone on the ground. There were also a few huts in these some of these circles. 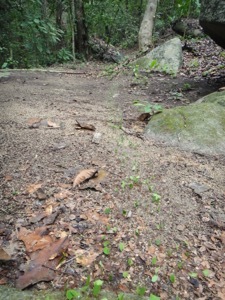 We were expecting more, as it was rated as a smaller version of the Ciudad Perdida. After about 4 hours, we reached the beach. We had built it up so much in our minds, and read so many good things about it, that when we saw it we were quite disappointed. The sand was grainy uncomfortable, the double crescent beach was tiny and uninviting, and the camping area was dirty and overcrowded. Two Germans we met in Leticia who also had visited Tayrona described it as ‘a nice beach, if you’ve never seen a beach before’, and they were entirely correct. It was such a letdown that we didn’t even bother to take any photos of it. From Cabo San Juan, we decided that instead of hiking back along the beach, we would take a speed boat back to Taganga, a fishing town near Santa Marta. The sea was quite choppy, so this meant 45 minutes of bouncing up and down(and fearing a little for our lives). 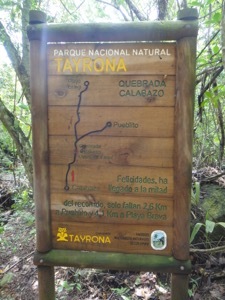 Overall Tayrona was a miss. We may have felt different if it hadn’t been built up so much, or if we had spent a couple days camping instead of a day trip, but I wouldn’t recommend coming to the region exclusively for the park. APPROXIMATE TOTAL : COP$1188,800 ($80.46 CAD) for 2 people, or $40.23 per person. Value for Money: 2/5 As a day trip it is probably not worth it, but if you’re planning to camp for a few days it could be a good place to relax.